The prospect of performing at L.A.’s Low End Theory was an exciting one for Zach “Shigeto” Saginaw. A week before his Wednesday night headline, the Brooklyn-based beatmaker announced that he’d be accompanying his routine MPC set-up with segments of live drumming. With a line-up consisting of turntable-heavy DJs like The Gaslamp Killer and Snorlax, Shigeto couldn’t have been a more welcome addition. While it’s certainly an awe-inspiring spectacle to see avant-garde beatmakers manipulating their various beats n’ rhymes with button-mashing technics and precipitated filter-sweeps, it’s also refreshing to see a performer like Shigeto incorporating a live instrument to a predominately electronic set-up. It reminds you just how versatile and raw these beatmakers can be even without the prominence of an MPC or turntable. Shigeto initiated his hour-long set with music from his recently released LP, Lineage. Unlike the rawness of Shigeto’s drumming, Lineage consists of the kind of intricately produced beats that incorporate various elements of audio manipulation, side-chaining compression, and nimble percussion — all of which are prominent features in the Los Angeles beatmaking scene. While much of the LP was left unchanged during his 60 minutes, Shigeto’s beat repeats and stuttering rhythm delays (all trigged by his MPC) were just enough to make the mix feel new and transformed. Additionally, Shigeto’s ambient sounds were perfect complements to the metallic textures of The Gaslamp Killer and Nobody beforehand. Things began to really heat-up, however, when Shigeto finally transitioned to the drum set during “Ann Arbor Part 3 &4,” which of course was followed by an uproarious roar from the audience. 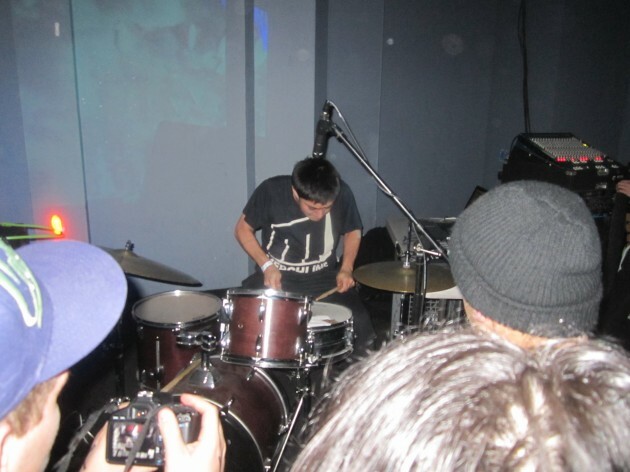 Not only was Shigeto’s drumming meticulous in the way he’d perform off-meter fills with ultra-quantized beats, but it was also remarkable in how perfectly timed each of his kicks, snares, and toms were hit. By never missing a note, and always keeping in time with the music surrounding him, he demonstrated a level of rhythmical dexterity that was both mind-boggling and aesthetically pleasing to the crowd. It was the kind of performance that could have only been achieved after years and years of perfecting and practicing. The near five-minute-long drum solo climax seemed like the only way to end such a tumultuous performance. While this week’s Low End Theory showcased plenty of novel talent (most notably, Snorlax on the bass-guitar), Shigeto’s performance was the most awe-inspiring because it showcased the most unique mixture of computerized production and human elements. He didn’t miss a single beat, nor did he ever lose sight of his laptop and MPC. It was simply a diverse and physically demanding performance that left the crowd floored all the way through. James McCall (“Nocando”) was practically speechless by the closing bow (“I’m pretty sure he’s a robot…”).